Leon Askin (German pronunciation: [ˈleːɔn ˈaskin] ( listen); born Leon Aschkenasy, September 18, 1907 – June 3, 2005) was an Austrian Jewish actor best known for portraying the character "General Burkhalter" on the TV situation comedy Hogan's Heroes. Askin was born into a Jewish family in Vienna, the son of Malvine (Susman) and Samuel Aschkenazy. According to his autobiography his first experience of show business occurred during World War I when he recited a poem before Emperor Franz Joseph. In the 1920s, he studied acting with Louise Dumont and Max Reinhardt. While working at Vienna's "ABC" cabaret theater in the 1930s, he frequently directed the works of dissident political writer Jura Soyfer. Askin immigrated to the United States in 1940 and, served in World War II as a Staff Sergeant in the US Army Air Forces. After the war, he went to Hollywood to begin a career in films, invariably portraying foreign characters who speak English with a strong accent. Askin appeared as the Russian composer Anton Rubinstein in a Disneyland anthology episode of the life of Peter Tchaikovsky. Fans of the television series Adventures of Superman recall his portrayals of an eastern European diamond smuggler (Joseph Ferdinand) in the 1953 black-and-white episode "Superman in Exile", and as a South American prime minister in a color episode. He appeared in 20th Century Fox's biblical epic The Robe in 1953 as a Syrian guide named Abidor. In 1960, he appeared in the film Pension Schöller, and the following year was prominently featured in Billy Wilder's film One, Two, Three, co-starring with James Cagney. He gained wide recognition and popularity for his recurring role as the stern General Albert Burkhalter in the sitcom Hogan's Heroes appearing in 67 episodes (including the pilot) of the show’s run from 1965 to 1971. Burkhalter was the gruff and rotund German commanding officer of Colonel Klink, the bumbling commandant of a World War II prisoner-of-war camp, manipulated by the American Colonel Hogan so the prisoners would get away with their clandestine activities. Askin made guest appearances on The Monkees 1967 episode "The Card Carrying Red Shoes", as Nicolai, on Daniel Boone in its 1969 episode "Benvenuto... Who?" as Roquelinm and in the "Fiddler in the House" episode of the 1974 situation comedy Paul Sand in Friends and Lovers as a violin virtuoso. Between 1977 and 1979, he appeared in Steve Allen's PBS series, Meeting of Minds, portraying Martin Luther and Karl Marx. He portrayed a psychology professor in a season six episode of Happy Days. In 1979 he portrayed the character Mr. Hoffmeier of Hoffmeier’s Bakery, judging a pie contest in an episode in the third season of Three’s Company titled, "The Bake-Off". His other film credits include roles in Road to Bali (1952), Desert Legion (1953), The Veils of Bagdad (1953), Knock on Wood (1954), Secret of the Incas (1954), Valley of the Kings (1954), Son of Sinbad (1955), The Last Blitzkrieg (1959), Lulu (1962), Sherlock Holmes and the Deadly Necklace (1962), Do Not Disturb (1965), What Did You Do in the War, Daddy? (1966), Double Trouble (1967), The Caper of the Golden Bulls (1967), The Perils of Pauline (1967), The Wicked Dreams of Paula Schultz (1968), A Fine Pair (1968), Guns for San Sebastian (1968), The Maltese Bippy (1969), Death Knocks Twice (1969), Hammersmith Is Out (1972), The World's Greatest Athlete (1973), Going Ape! (1981), and Frightmare (1983). In 1982 he had a brief appearance as a Moscow Anchorman in the film Airplane II: The Sequel. 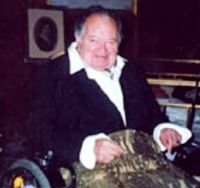 Askin died from natural causes in Vienna on June 3, 2005 at the age of 97 and is interred at Zentralfriedhof. 1996: Award of the title "professor"
^ a b "Leon Askin Biography (1907-)". Filmreference.com. Advameg. Retrieved 2011-07-09. ^ "Reply to a parliamentary question" (pdf) (in German). p. 811. Retrieved 14 January 2013. ^ "Reply to a parliamentary question" (pdf) (in German). p. 1383. Retrieved 14 January 2013. Wikimedia Commons has media related to Leon Askin. This page was last edited on 6 April 2019, at 20:19 (UTC).